My blog list is now at the bottom, since I'm probably the primary user. ... 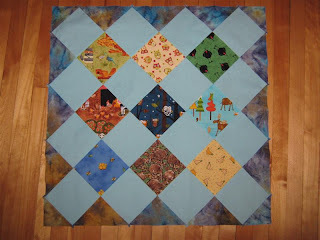 I've added a list of my completed, planned and in-progress quilts. Probably best of all, I'm working on a How To list with tutorials by me and you, as I found I constantly had to go back to find the link to the ladder stitch for example, this way it's right there and handy! I Think I'm Caught Up? I just spent my lunch hour browsing through my blog list - which is again waaaaay too long. Not humanly possible for me to do them all justice. Fellow blogger Crispy has a policy of commenting every blog she visits, I wish I'd have time to do that or the discipline to only look at a few blogs, sigh. Anyway, I have a headache now because I've seen so many beautiful projects and have about 5 patterns I want to make. Which brings me back to my WIPs - I'm actually kind of tired of them. 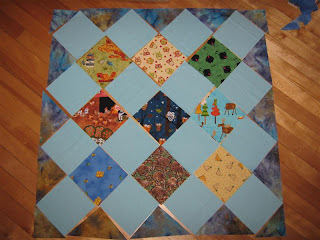 I wish they were all done so that I can start a new project with a clean slate. Hah, like that's ever going to happen! 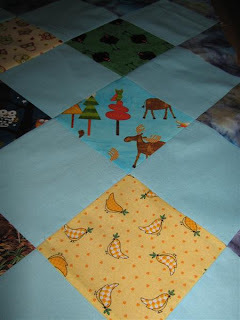 Here's a little update of the bird quilt I made for my friend. It took 3 days of travel and camping before we had a dry, well-lit spot to get started. I showed her the running stitch and off she went. 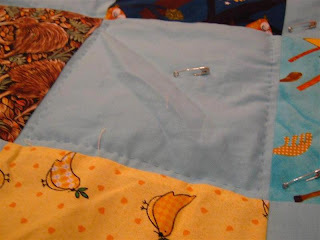 I couldn't believe her first seam (outlining the blue diamonds) - the stitches were straight, even and small. Incredible. She actually got a bit more lax later, probably tired :) But what a natural she is and she really seemed to like it! On the last evening of our vacation, I finally had a chance to show her the binding stitch, Mal's hidden ladder binding stitch (See new HOW TO's tutorial list on the right). A long hiatus, I know! I've been on vacation and now my mother is visiting, plus I've started teaching a quilting course at community school (volunteer-based, in the evenings, 12$/class, a super deal for people. It runs for 11 weeks). 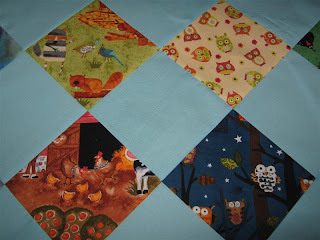 I promise there'll be more quilting stuff here again in the future, stay tuned! 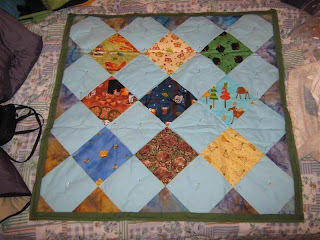 I bet you forgot about this quilt! 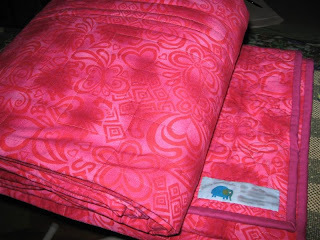 The pink quilt :) It was basically finished, except for threads hanging loose along the seams and a missing label. Well, I remedied the threads, mostly snipping them, unless I hadn't backstitched. Then came the search for a label. The quilt is for a friend of mine in Germany, and luckily she's one of those persons you wish had more than one birthday because she's so vocal and clear about what she likes, it's always easy to find something for her. 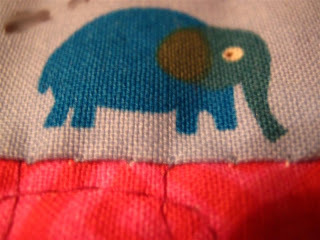 Anyway, she really likes elephants and I just had some cute elephant fabric arrive in the mail. So I cut a small patch of the fabric and used that as a label. I have to say that I really like using printed fabric as label as opposed to plain muslin - might be a good way to use up some of my scraps, too! A dear friend of mine is going through a difficult time - too much worrying, and extreme amount of worrying, so much, that it's affecting her life enjoyment and her daily functioning. She's going on vacation with me soon, but I also thought, what better form of therapy (besides counselors and pills :) than quilting. 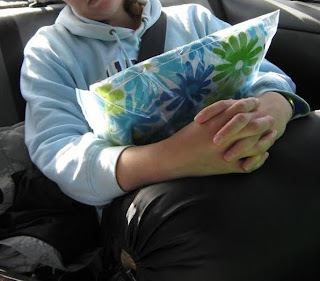 She's never quilted before, but I asked her if she's interested in handywork and sewing, and she gave me the thumbs up. 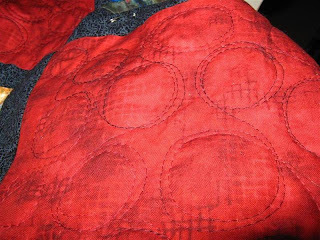 So instead, I whipped it together in less than an hour and will sandwich it for her - she can handquilt it on her own time, and I'll give her basic lessons on handquilting and binding on our vacation. The diamonds are 6"x6" with light blue background and blue-purple-yellow batik as the framing triangles (cut from 6" squares, except the 4 smaller corner triangles which I cut off 6.5" squares). 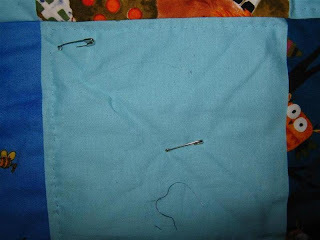 I really hope this will work for my friend, it's worth a try anyway, maybe we'll have a novice quilter soon!!! 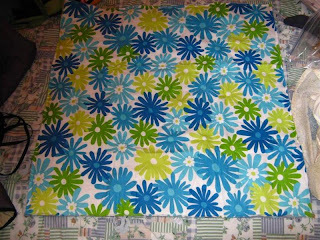 1) Cutlery Baby Quilt - FINISHED! 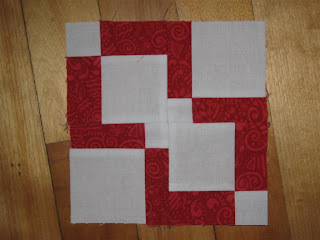 5) Oriental Quilt - FINISHED! doesn't involved turning the massive quilt, yay!!! It is true though what everyones says - pebbles use a lot of thread... 7 bobbins so far. I'm using red-black verigated thread for the top. black for the bottom.